Historic Environment Scotland visited the quarry today as part of their ‘Staff Away Day in Angus and Perthshire’. The visit was led by Brian Binnie, Owner and Director of Denfind Stone. 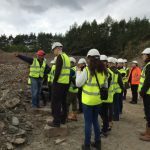 The group of 30 representatives spent over an hour with us, which included a short presentation covering the history and quarry/business and a tour of the working quarry and stone operation. The group included a few well known faces with close links to the business and a few new ones, fortunately the weather was kind to us all and everyone headed happily off to their next destination, Edzell Castle.